The wife, lovely person such as she is, always complains I spend too much money. Sometimes I buy a toy for myself. After all, he who dies with the most toys wins – and I still have a little room in the garage. But most of what I do is an attempt to make her happy. All men know it’s important to keep the wife happy or she’ll make sure you’re unhappy too. The one on our house is so old I believe it was first operated by a water wheel. 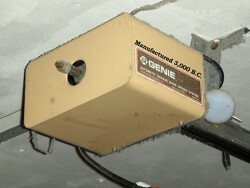 Not only do they not make parts for it any more, the model number stamped on the side is in some stone tablet language. But it works and one should never mess with something that works or it might break. Then you have to try to fix it. You see this coming, don’t you. The wife doesn’t like the remote control to open the door. She says the stuff in her purse can push the button and open the door. Considering what she has in her purse I’m not surprised. I believe I once saw a frying pan and a 1931 Hoover vacuum cleaner in a side pocket. She’s one of these ladies that has a purse the size of an overnight bag and still carries two other bags with her when she leaves the house. I’m never sure if she’s going to the store or moving to Idaho. I try to be a good husband. So I figured I’d put one of those fancy keypad things outside the garage door. Then she could push some buttons instead of spending 3 days trying to find the remote buried under the vacuum cleaner and three pairs of shoes in her purse. 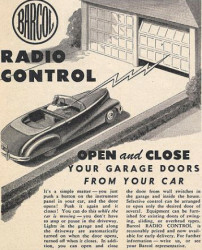 The garage door opener is so old they don’t make doohickies that’ll connect to the ancient wireless system that it has now. I found this out after I bought the keypad and 3 brand new real small remotes. That’s okay – Amazon.com has everything. I just have to replace the entire wireless control system on the opener with a wiz-bang universal, work-with-everything black box the size of a small garbage truck. And I won’t know if the other stuff I bought will work with it until it’s installed. Anticipation is a wonderful thing. What started out as a loving attempt to make her life easier has turned into putting a Ferrari engine into a 1962 Ford Falcon. Several weeks from now, after dedicating my life to this transplant surgery, it should be ready to go.